Likecoin is a digital currency that the authors of content are rewarded for each YouTube like. Likecoin is based on Blockchain technology using the mechanism called “Proof of Popularity”: the higher the popularity of the video and the more likes it gets, the bigger is the amount of cryptocurrency rewarded to the author. This technology makes it possible to monetize video content easily and to get a decent reward without adding any advertising or attracting advertising agencies. No matter whether you are a YouTube superstar or just a beginning videoblogger, anyone who knows how to make an interesting video, should receive a deserved reward! To monetize the video you will no longer have to annoy your subscribers with long and intrusive advertising. From now every videoblogger will be able to think only about the quality of the content, Likecoin will take care of monetization! Get crypto coins for each like that your video gets. It is almost impossible to earn significant money in YouTube, even if you are a popular video blogger with a crowd of loyal fans. Advertising does not always bring the desired income, and the large amount of it annoys subscribers. Likecoin is specially designed in order to make the process of monetization of your videos easy and fair. This is a cryptocurrency that is given for each received YouTube like. Earned coins can be freely exchanged between participants, and can be changed to other cryptocurrencies or real money. It makes sense to join Likecoin even for those who do not yet have a large audience. The emission of coins in the system is nonlinear and a larger number of coins will belong to those who joined the system at an early stage. In addition, unlike YouTube, the system has no minimum requirements for the number of subscribers and views – you can start earning from the very first like. Likecoin is a new promising asset that is dynamically developing and growing. Unlike most cryptocurrencies, Likecoin is a currency that is used not just by a narrow circle of geeks and crypton enthusiasts, but by a large number of video bloggers and their subscribers which as a consequence contributes to the growth of its popularity. Moreover, the emission of coins in the system is highly non-linear in time: at an early stage of development, a large number of coins are issued; eventually growth slows down significantly. By investing small amounts of money in cryptocurrencies, a crypto investor can potentially earn significant income in the future due to the growing of the popularity and the demand. No need to wait until your channel is popular and collects thousands of subscribers. Start earning now. Unlike most cryptocurrencies, Likecoin is arranged as clear as it possible. Wallet registration will take less than a minute. Finding an advertiser for your blog and negotiating with them is a time-consuming process. Make this time free, leave it for creativity. More time to create content, less time to search for monetization. The whole system is based on blockchain technology and therefore is absolutely transparent. All transactions and issue of coins are in public access. Unlike most cryptocurrencies, here your private key is a secret phrase that only you know. It is not stored on the disk, it can not be lost, it can not be the target of viruses-hackers. The mission is to create a simple and fair way to monetize author content. To develop a simple, clear and convenient ecosystem, allowing the authors of interesting video content to concentrate on their work and focus primarily on their subscribers, rather than on the requirements of the hosting websites or the wishes of advertisers. * Based on data from the Livecoin crypto-exchange. Development of a General concept. Design of blockchain platform architecture, basic cryptography. Development of a platform prototype . Beta version release. Start of ecosystem formation. User registration, first YouTube video and likes in the blockchain registration. The release of the landing site, the first version of the web wallet. The launch of the block Explorer. Activation of anti-phishing protection in web wallet. Testing and release of the node's open API. Start of the coin listing process on cryptocurrency exchanges. Support for multi-accounts in the web wallet. Listing of the coins on third-party cryptocurrency exchanges. Registration of likes of other popular social networks. Exchange of likes within the platform using the internal decentralized exchange of likes. Development of widget-button "LikeC". Implementation of ML and Anti-fraud systems to prevent likes cheating. The implementation of the DPoS consensus System, Multichain system an and decentralized system of oracles. Development of a decentralized platform for posting media content: blogs, channels and video blogs. Open authentication system for "live" users. Development of a cryptocurrency based on the preferences of people in the real world. Likecoin is developed by people with versatile experience in IT, R&D, blockchain projects. We are happy to be working on a platform that will simplify the lives of creative people and will allow them to focus more on their creative work. There are no miners in its classical sense. Miners are rather video bloggers who are connected to the system. The quality of the video blogger`s content and the activity of its subscribers ultimately determines how many coins will be issued to them. A certain amount of coins is issued per time unit and distributed among video bloggers (“miners”) according to their activity. Unfortunately, the passphrase from your wallet can not be restored! It is not stored on project servers or any other party. While registering your account you need to remember the passphrase well! In fact, the combination of a login and a passphrase is the key to accessing your funds. This is your private key. If you lose the phrase, you will not be able to restore access to your account. It is also important to remember that the passphrase cannot be changed or restored in the future. Where can I sell coins? On which cryptocurrency exchange can I find you? Now Likecoin is being traded on crypto-exchange Livecoin. Pairs: LKE/BTC, LKE/USD, LKE/ETH, LKE/RUR. We plan to enter on other crypto exchanges in the 1st quarter of 2019. What should I do to connect Likecoin to my videos? It is very easy to connect. The interface is intuitively clear. – There`s also a section "My videos" in the wallet. It is necessary to copy the special text and place it in the description under your video. That’s it. Coins will start falling on the account with each like that your video gets. Can I activate Likecoin to my old videos? Yes, it is possible, but the coins start to be charged only for new likes. Will my coins stay on my account if I delete my video? Videos and likes to them are only needed to generate new coins. Are dislikes counted by the system? No, dislikes are not counted by the system. How many coins I will get for each like to my video? The number of coins issued for one like (the so-called Leak Rate) varies depending on the current total activity of bloggers, the total number of likes for the period. This rate may change from time to time. And in general, with the connection of bloggers, it is constantly decreasing. Now Like Rate varies around 4-6 coins for one like. The exact value of the rate can be found in the block Explorer (like Rate parameter). It makes sense to connect Likecoin now, because with the low competition so far, you can earn a large number of coins. With the growth of the project, with the growth of the number of bloggers, the amount of coins charged for the like will be greatly reduced. Why do you use your own blockchain? In almost all of the blockchain platforms there is a limit of the number of transactions and the size of commissions. In Likecoin, information about the change in the state of each video and each like needs to be recorded in the blockchain. It is obvious that none of the existing blockchain platforms will not cope with adding such massive amounts of data without the appropriate commissions. What are the principles of issuing new coins in the system? 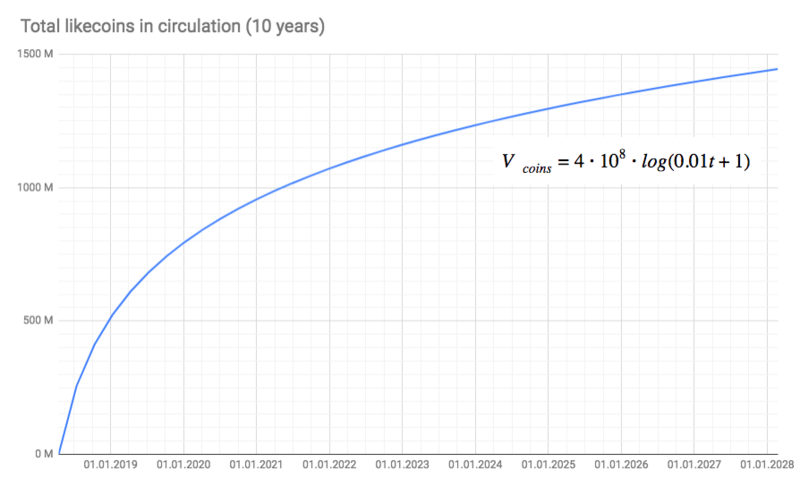 The issue of Likecoin coins is time-bound and occurs in accordance with the logarithmic dependence. As a result, the size of the final issue of coins is not limited to a certain amount (like it happens in Bitcoin). The issue of coins is limitless. However, over the time, the rate of issue is significantly reduced and becomes close to linear dependence: with approximately constant inflation rate of 2-3% per year after 10 years of operation of the network. What type of consensus is used to confirm blocks in Likecoin? Currently all blocks are confirmed by a single master node. The external status (the number of likes in the video) is analyzed and recorded in the blockchain by special services – Oracles. However, all data in the system is completely public. Each coin transaction has a link to the source and is easily verifiable. Centralized oracles and block confirmations at this stage are rather a forced decision, as the current blockchain platforms do not allow adding a large number of transactions without charging the corresponding fees. In the future, the developers plan to make the confirmation of the blocks fully decentralized using the consensus DPoS (Delegated Proof of Stake), and to develop a system of decentralized oracles for the transfer of external information to the Likecoin blockchain. Ready to get started with Likecoin? Start to convert your likes into cryptocurrency right now!